Isabelle Grace Jewelry has simple yet interesting personalized necklaces that will be a keepsake worn close to her heart. 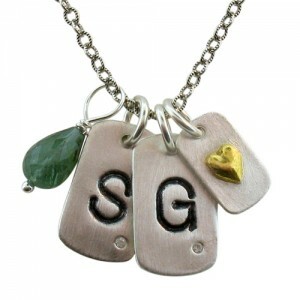 Their Signature Mini Tag Necklace is their most popular style and another great custom gift options. It includes one initial tag with a small cz inset and a small tag with a gold heart and is $125.00. However, the choices are endless, so create something she will love. Choose custom charms, stones, and several types of chains. From heart shapes to lightening bolts or from amythest or pink tourmaline, we are certain she will cherish a necklace from Isabelle Grace. If you can’t decide, buy her a gift certificate to www.isabellegracejewelry.com and let her create her own.